Hello BONES fans and happy 2014 to you! How did you like this episode, “The Ghost in the Killer”? To me, it felt a lot like a season premiere. There was a lot of exposition to bring people back up to speed (or perhaps introduce Pelant, etc. to new Friday viewers) and there wasn’t really a resolution to the case; instead, this episode set up an arc involving a new serial killer. Let’s discuss! Booth, Brennan, and the rest of the Jeffersonian team may be dealing with another serial killer when BONES returns on January 10th, but Brennan will have to convince them of the person’s existence before they can go about trying to catch the newest big bad. 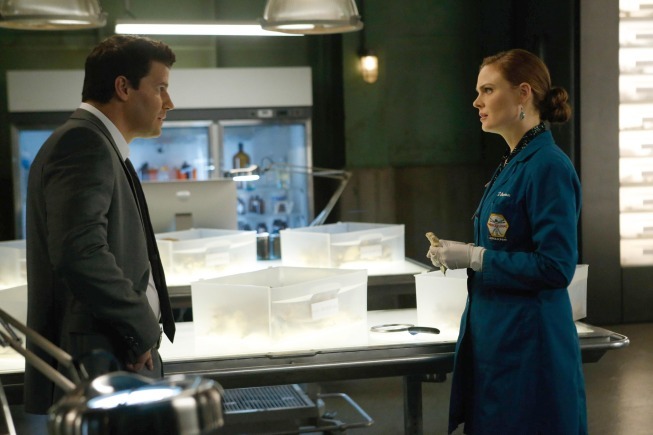 BONES returns with new episodes Friday, January 10, 2014 at 8 PM on Fox. BONES ended 2013 on a high note, and after watching the first few hours of its return in 2014, I’m happy to say the show kicks off the new year right, too.